The Nokia Store has a new section for NFC apps and there is a new addition to the section. 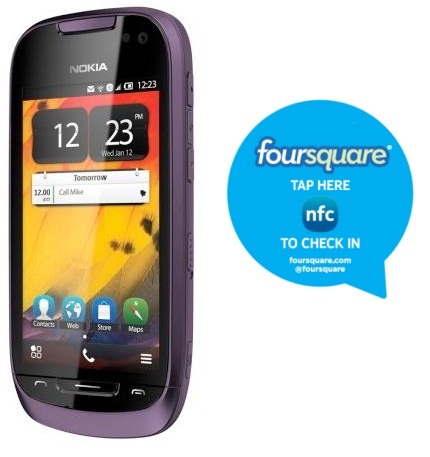 The new version of Foursquare for Nokia Symbian Belle devices is out and it is said to bring in some NFC magic. Now you may ask how can NFC be used in Foursquare? Well the new version of the application uses the NFC enabled phone to check-in automatically by just tapping at an NFC enabled/tagged poster. You don’t need to open to the app, just a simple tap. The developers have made it even easier for the user to check-in without the need to have the app running just tap and the app starts automatically and checks you in. The idea is brilliant, even though NFC tags haven’t really made their way around the world, especially in India. However, you can visit here to create Foursquare Check-in Smart Posters or click here to get NFC tags. Foursquare with NFC support is available in the Nokia Store for Symbian NFC enabled phones which you can download over here and is going to be out soon for the N9. For more on this, visit here.